Heads up industrial designers, lighting luminaries, and creative crafters – enter your design in competition and you could win $1000! 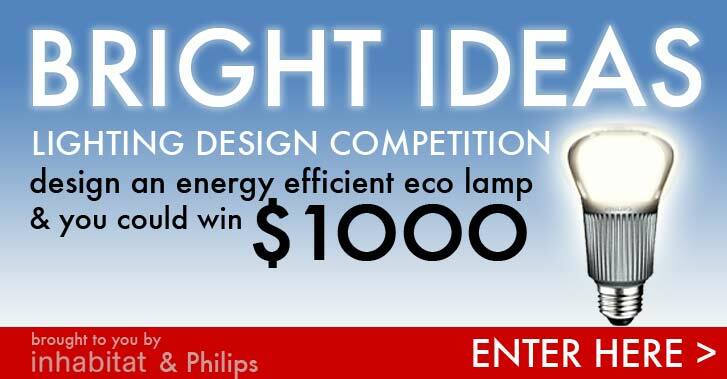 Do you have an idea for a engaging energy-efficient lamp that shines a light on sustainable design? Then submit it to our Bright Ideas Lighting Design Competition for a shot at winning $1,000 in prize money and international exposure to an audience of millions of readers! We’ve teamed up with Philips to challenge you to design a lamp that showcases the potential of low-energy LED bulbs. Our distinguished panel of judges will be selecting 20 design finalists that excel in the fields of aesthetics, creativity, sustainability, and commercial viability. We’ll be accepting entries until Midnight on May 22nd, so if you have a brilliant idea for a lamp that can hold an energy-efficient LED bulb submit it today! Why only US residents? isn't that a little limited? I submitted my entry and then realised that the competion is only open to participants from the USA. Shouldn't Canada have been allowed to enter? The Philips bulbs are sold here, in fact I have just completed changing every bulb in the home. can somebody tell us if UK residents can participate? What an incredible opportunity for designers to strut their stuff! It's encouraging to see Phillips push innovation in the sustainable lighting arena. Is the contest only for US residents? Heads up industrial designers, lighting luminaries, and creative crafters - enter your design in competition and you could win $1000!